The Agri-Fab 45-0492 Towed Smart Sweeper has a 44 inch (112cm) working width and makes a clean sweep of leaves, grass cuttings, petals and lawn debris. 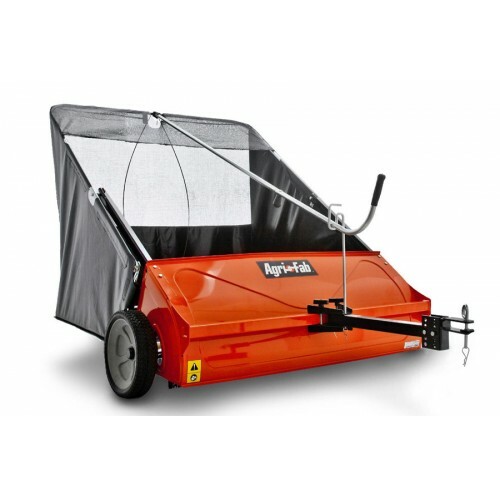 The unique off set hitch allows you to mow and sweep at the same time. The one-button adjustable brush height saves time and with its large 25 cubic ft hopper capacity will do a thorough and efficient job. Its unique design enables easy dumping of debris from the tractor seat. * No Tool Assembly - Easy to assemble - No Tools Required!! * Extra-Large Flow Through Bag - So you don't have to dump as often. * Brush Height Adjustment - Easy to adjust brushes to correct sweeping height. Built in gauge to measure the depth for precise cleaning.